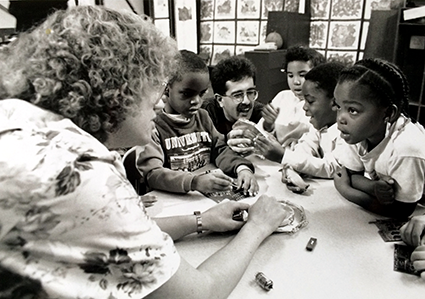 Dr. Denice Denton (L) and her graduate student Reza Ghodssi (C) share engineering concepts with children at the University of Wisconsin in the early 1990s. This summer, an innovative workshop will help support and develop a new generation of academics. The invitation-only Denice Denton Emerging Leaders Workshop, June 3 in Madison, Wisc., has been designed for a new generation of academic women and men. The workshop focuses on mid-career faculty in engineering, computer science, math and physical sciences, particularly but not exclusively women and underrepresented minority faculty. It will help them develop skills, knowledge, and critical networks with colleagues; and provide opportunities for them to learn strategies for success from more senior peers, including developing leadership plans. The workshop is being organized by a group of faculty recipients of a prestigious, decade-old award that is sponsored by Microsoft and recognizes junior faculty members for high-quality research and significant positive impact on diversity. One unique aspect of the workshop is that up to 10 senior graduate students in science and engineering who are inspired to become faculty members will be selected to attend. The workshop also aims to contribute to transforming the climate for everyone in science and engineering, independent of race, ethnicity, gender, gender identity and expression, sexual orientation, country of origin, and other dimensions of diversity. University of Maryland Professor Reza Ghodssi (ECE/ISR), director of the Institute for Systems Research, is the lead organizer and chair of the workshop. Sponsors include the University of Maryland, the University of Wisconsin, Stanford University, the University of Alabama, the Anita Borg Institute for Women and Technology, the National Science Foundation, and other contributors.